As a certifiable (different from certified, mine requires a psychiatrist!) 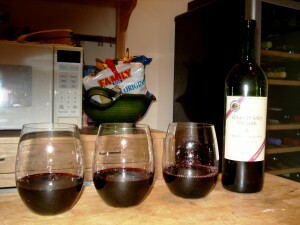 wine geek, I get a lot of questions about serving and preparing wine so that it can be happily sipped. One of the biggest questions concerns the aeration of wine…how do I like to aerate my wine, whether young or old and what do I like to use to do so? For the most part, I tend to decant my wines, but that isn’t always the easiest thing to do every time I open a new bottle. Sometimes I might only want part of a bottle and then the wine is hard to store once decanted. Or, I might just have more than one bottle open at a time and I’m pouring like crazy because I have some thirsty friends, ready to partake. In that case, I find that a wine aerator tends to do the trick, i.e. 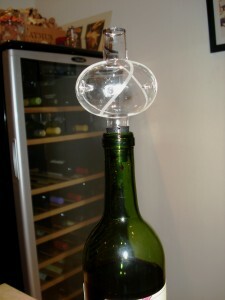 a wine gadget that actually works on a per glass basis and usually by being inserted into the bottle. The larger question looms…which one is the best?? 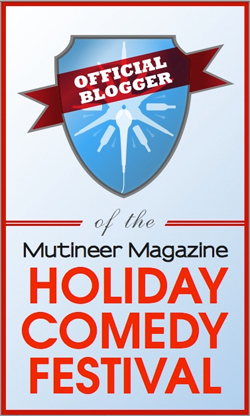 This article is here to try and tackle that vinoquery! This contestant hails from Italy and has a beautiful design of carved wood and hand-blown glass. Just sitting alone, it makes for a very artistic addition to the room or dining table. Replete with two globes and a spout, topped with the wood, it has beautiful form. Conveniently, it also has single-handed operation, being placed in the bottle for use. This particular aerator has had a big push into the US market over the last 6 months, including some very cool social and multimedia campaigns. One of the videos is particularly helpful to learn how to use this aerator and a good watch. 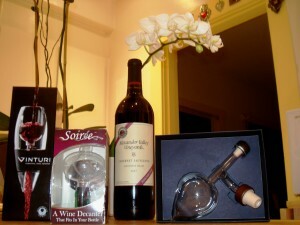 The Wine Soirée is another great single-hand operated wine aerator. Featuring an easy in-bottle design and stylized main bulb for the oxygenation of the wine, this is the easiest of the three to operate. There are two different rubber seals depending on the type of bottle that will be opened. The packaging also contains a handy stand with which to dry the aerator when done and after rinsing. Their website also features a handy video where you can learn the easy methods of the WS. 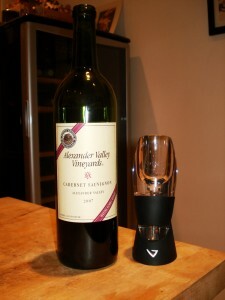 The Wine Soirée is widely available in the US and can be found at many wineries in California, proving that the winemakers themselves must think highly of this aerator! The Vinturi comes in two different flavors, red and white but I was only able to test the red iteration. The white version is described as having different dimensions and flow rate to better suit white wine. 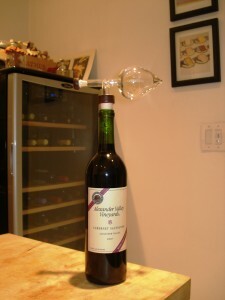 This patent pending design is possibly the most dramatic, merely because as the wine travels through the device a distinct sucking sound punches through the air…definitely getting you noticed at the your friends’ wine and cheese party! A drawback in my setup is that it requires a two-handed operation, where the Vinturi actually blocks your view of the wine glass to see how much has been poured. They do offer stand to solve this issue as well as a steel filter for sediment and cork bits, but they cost extra. Your purchase of either of the aerators includes a stand to contain drips and/or hold it upright while drying, as well as a velvet carrying pouch. I decided to take (not surprisingly) something of a scientific approach to tackle this comparison. The wine I chose was one in which I had a fair amount of familiarity from past vintages so that it was something that I could recognize stylistically to neutralize another variable, that of an unknown wine. My wine for the evening was the 2007 Alexander Valley Vineyards Alexander Valley Estate Cabernet Sauvignon, a very solid, balanced and high QPR Cab. I then poured four glasses of wine, 1 as a control with no aeration and the other three with the exact same amount in each one, properly utilizing each of the aerators. In retrospect, it would have been great to pour one additional bottle into a decanter for the same amount of time as each glass as another, somewhat positive control. Each aerator’s glass was poured and left to sit for 2 minutes before evaluation, just as I did with the control straight from the bottle. I used my typical three component tasting structure of Color, Nose and Palate, with the Color the same across all glasses, of course. With the tasting method now elucidated, let’s launch into the tasting notes! N: Black fruit that is slightly muted, some toast oak underneath and some char. P: Full and all black fruit, with oak underneath, firm grip and some charred earth in the juicier, good acid black fruit finish. N: Bigger oak, underneath, with dark berry fruit and some newly wet earth at the end. P: Full and sinuous with good grip, all black fruit and chalky, dusty tannins. N: Bright black and red fruit here with some charred earth. P: Plush black berry fruit here, still with good brightness and good acid in the chalky black fruit finish. N: Drier black fruit with dusty oak under. P: Blackberry fruit here as well, with some of that firm grip and good acid. Oak in the juicy finish of ripe currants. I think the most interesting finding of this comparison was the number of differences and similarities that I found across all of them. Each aerator was noticeably different from the other: more oak in the Centellino glass, bright black and red fruit in the Soirée and a juiciness to the fruit in the palate using the Vinturi, all different from the more muted nose and oakier palate of the control glass. Alternately, all four glasses showed a depth of black fruit and a good balance of tannins, acidity, mouthfeel (though a different style in each glass) and fruit; typical of this fine Alexander Valley producer. The fact that the oak was more prominent in both the Centellino and the control glass along with the less plush fruit in the palate in both leads to think that there was less aeration in the Centellino in comparison to the Soirée and Vinturi…which isn’t necessarily a bad or good thing, it’s just different from the other two. The more integrated oak of the two latter aerators, along with the more complex fruit that exhibited greater depth shows a more opened glass of wine in both glasses. Taking all of this together, I’m actually apt to recommend all three aerators, each with their own specialty. Let’s say you have a more delicate styled wine that still requires some air to open up and your guests are set to arrive within minutes…grab your Centellino and wait until they knock on your door! That young Pinot will open right up and not be overly oxygenated and look freaking awesome in front of your friends as you pour them their first glass, right after they walk into your home. Do you have a more burly, full-bodied wine that still needs a bit of age to be ready to drink right from the bottle? Grab your Soirée or Vinturi and aerate that sucker right into its optimal drinking state with either one of those two nifty items. Either one of them will be able to handle the mad oxygenation that is needed to let that lumberjack of a wine sing a Monty Python number! Have you had a good or bad experience with any of the aerators discussed above? Let me know in the comments, I’m very interested to hear what you’ve found with your own wines! This is just the kind of thing I’ve been hunting for! Wonderful and thankyou! Hello Peter, thank you for checking out the article and your comment. Yes, the Vinturi is made of plastic, which I didn’t reference in the article. To which bubble are you referencing? 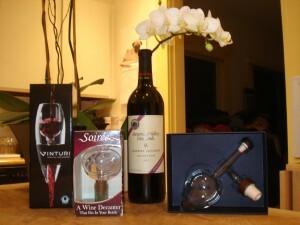 Also, you might want to point out that you appear to own a competing wine aerator, The Wine Fall. I would be happy to review your product if you are interested. Cheers! Sorry to have to be the one to burst the bubble but the Vinturi is Acrylic Plastic. There’s a new king of the aerator hill! “…My favorite such device, which works better and is more attractive, is called the WineFall, a hand-blown glass “tube” with a series of layers developed by Sonoma County wine marketer Pete Nudi and glass artist Tom Hassur. The WineFall aerates wine more efficiently than can be done by splashing the wine back and forth between two decanters for a half hour. Wine is poured into the top of the WineFall, and the liquid sluices layer-to-layer through the glass into the waiting decanter below. The effect is not only stimulating to the taste buds, but it also aerates the wine in a way I haven’t seen any other device achieve. For the wine lover and collector with all the accoutrements’ of the trade, this is one device that may be used more frequently than all the others. … …read about it on the Internet or watch a video http://www.thewinefall.com/video.html) and you may be convinced it’s worth the investment. Have you reviewed this item? … hand crafted in Sonoma County, there fore everyone is a collectors’ item! like the graduation of one’s palate, or graduating from dollar stems to Riedel, we evolve. Thank you for the headsup on your new wine aerator. I haven’t used it yet no, nor have I had the chance to read Berger’s article yet after being in Europe the last two weeks. I’ll make it a must read. I have never encountered a plastic wine aerator however, so I don’t see how that is an improvement on the ones that I’ve reviewed/used in the past. They have all been glass or crystal. Cheers!